Don't mess with Texas, and don't mess with Sue Anne! Sue Anne has been a Senior Developer for DBI Software since our beginning in 2005. Her many coding talents are used everyday by DBI customers when they use Brother-Panther, Brother-Thoroughbred, Brother-Eagle, or Brother-Hawk. All told, Sue Anne is responsible for millions of lines of code. Prior to DBI Software, Sue Anne worked for BMC Software on various products such as SmartDBA. 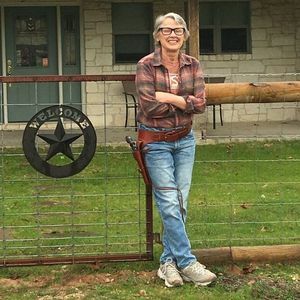 When she isn't busy writing the world's most awesome code, Sue Anne takes care of her many animals on her ranch estate. The gun in her holster has been used to kill rattle snakes and bugs in Brother-Panther.